George Fant (74) in a game in 2016 against the Saints. Rookie George Fant has had a rather remarkable journey to earning the starting left tackle spot for the Seattle Seahawks. Maybe the most amazing thing about the rise of George Fant from college basketball power forward to Seahawks’ starting left tackle in the span of about 20 months is how unremarkable everyone seems to view it. Not with the Seahawks, anyway, who in recent seasons have turned a college tight end who was an undrafted free agent into a starting right tackle within two years (Garry Gilliam) and converted a college defensive lineman into a starting guard within a year (J.R. Sweezy) among other seemingly unlikely success stories. Still, even by the Seahawks’ leave-no-stone-unturned standards, Fant’s story is unique. It’s one that’s been told a few times now. How Fant, who hadn’t played football since eighth grade, decided after his final basketball season at Western Kentucky University in 2015 to take a stab at a football career after determining that if he wanted to make money in basketball he’d probably have to go overseas. How after a year spent mostly watching and learning during the fall of 2015 at Western Kentucky he caught the eye of NFL scouts during WKU’s Pro Day, having bulked up to 296 from the 250 he played during his final season of basketball (he credits some of it to eating regularly at famed Skyline Chili while training in Cincinnati) and still recording a 37-inch vertical leap. How he signed with the Seahawks over a few other offers and instantly impressed Seattle coaches with both his athleticism and quick learning ability to earn a spot on the 53-man roster, if initially maybe cause they didn’t want to lose him via waivers. The Fant story took an even more storybook turn this week, though, when Cable announced he was now the starter at left tackle regardless of the return to health of Bradley Sowell, who started the first six games of the season before suffering a sprained knee. Fant took the news in the same apparent stride as he has ever other step of this journey. Fant also has already seen how quickly things can change. While he was the 13th-leading scorer and eighth-leading rebounder in WKU history, it’s simply not that easy to make a living as a 6-5 power forward, something that came as a tough realization. “I had my mind set and I thought I was going to play basketball the rest of my life,’’ he said. But then the reality hit that potentially going overseas — he says Poland was one option — didn’t seem as appetizing, especially once he got married to former WKU women’s star Chastity Gooch and the couple had a child. WKU coaches had tried to get him to play football throughout his career there, and he says friends such as Tyler Higbee (now a tight end with the Rams) told him they’d teach him the game. After the 2014-15 basketball season, he finally decided to take the plunge, though he saw little action in the 2015 football season (which was a fifth year of athletic eligibility) as he tried defensive line, tight end and offensive line. After the season, the Seahawks saw a little of what Cable laughingly called “bad’’ film (meaning, bad in the quality of the film itself). “But you saw this athlete,’’ Cable said, pointing to the team’s co-director of player personnel Trent Kirchner as initially discovering Fant. And Cable said the much more plentiful basketball film told them even more about Fant. So do some physical things — Fant has often compared blocking as a tackle to what it’s like cutting off the baseline playing defense in basketball. Not that anyone could have necessarily predicted this — Fant not only starting and playing all of a win at New England in just his third full game but also credited with not making a single assignment error. It’s one that so far has hit, though as Cable himself cautioned this week, there’s a long way to go. “Can you do it again and again and again?,’’ he said of Fant’s next challenge. 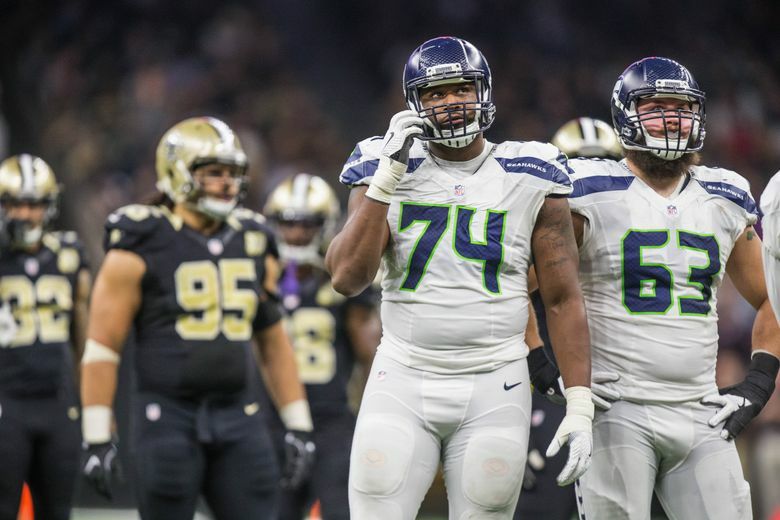 The Seahawks will continue to find out in earnest Sunday against Philadelphia, when Fant again takes the first snap at left tackle, though this time doing as an anointed heir to the likes of Walter Jones and Russell Okung, not as just an injury replacement. If he then stays there a while, though, the least surprised people may be the Seahawks themselves.